Just when it seemed that the Tour of Spain overall classification was going to remain set in stone until Sunday?s finale in Madrid, CSC?s Carlos Sastre managed to blow the race apart on Thursday?s stage 18 – if not completely, at least enough to revitalize the near-stagnant fight for gc. A long-range attack inspired by Sastre saw a 12-man move go clear close to the summit of the Puerto de Mijares, the first climb of the day, and stay away throughout the stage to Avila. In a textbook piece of racing, Sastre sent three CSC team-mates up the road in the first hour. 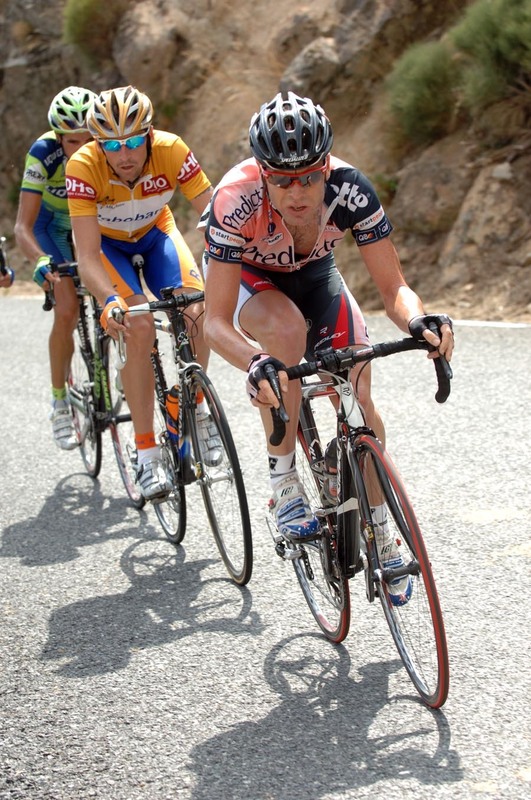 He then bridged across to the early break three kilometres from the summit of Mijares and the race was on. Even if Denis Menchov (Rabobank) smelled trouble from afar and tore across immediately afterwards, closely followed by almost all the race favourites, his fellow Russian Vladimir Efimkin (Caisse D?Epargne) did not – or could not. Come the finish in Avila – a mere 100 kilometres later – Efimkin had lost nearly two and a half minutes on the stage leaders, and slid from second to fifth overall. Cadel Evans (Predictor-Lotto), Sastre and Samuel Sanchez (Euskaltel-Euskadi) each moved up a slot as a result, to second, third, and fourth respectively. The stage was won by Andalucia-Cajasur?s Luis Perez with a gutsy lone move from the 12-man break 10 kilometres from the line. But Perez swansong – the 33-year-old is due to retire after the race – and the huge success a Vuetla stage win represented for his tiny Continental Professional squad was partly overshadowed by Sastre?s dramatic attack. The CSC leader revealed he had laid a smokescreen by telling the press he was tired and would not make any more attacks on Tuesday and Wednesday. It turned out, on the other hand, that he had been plotting and plannign in the meantime. ?When I sent my team-mates up the road, we wanted them to get a good margin. The plan was then for me to bridge across.? ?It worked out perfectly, and I?ve moved up a place overall. That?s important.? Sastre refused to comment on what his plans are for Friday?s final mountain stage, but it seems certain after Thursday?s success he will be more than motivated to attack again. How far will up the podium it will finally get the Spaniard remains to be seen – although in any case, for the Vuelta, after ten days where the overall classification has barely changed, his aggressive racing has been a real breath of fresh of air.